I have never heard of this guy before & he has a funny voice. But i just happened to be listening to Radio 2, chilling out- and what a wonderful show. Great 7 eclectic mix of music ending with ella fitzgerald#s glorious Manhattan. I did, but although I agree about the wonderful Ella and Manhattan, I'm sorry but I didn't think very much of the format of the show. I think it's gone back to Charlie Chester days and I also think Sunday should be remamed Malcolm Prince's Radio 2 as he produces 4 hours of the schedule now with Elaine Paige and now Paul O'Grady. Too much of the same for my liking. But i just happened to be listening to Radio 2, chilling out- and what a wonderful show. Great 7 eclectic mix of music ending with ella fitzgerald#s glorious Manhattan. I didn't listen this week but I do like Paul. His autobiography (well, his life up to the age of 21. He's writing Book 2!) is a very good read. I listened on and off (had to keep an eye on the United Villa game!) and found it very enjoyable. I thought the format was good and Paul worked it well - it's nice to have something different on a Sunday. And the music choice was good, too. At least they didn't rely on the playlist! I listened to it, off and on. I don't mind P O'G normally, but the thought that crossed my mind was this. When Ed Stewart was replaced by JW in this slot, I was sorry to lose him but couldn't help but think that JW was a very acceptable subsitute. Try as I might, I can't see that P O'G is a better substitute for either of them. There was a lot of nonsensical chat. With JW the chat was about the music industry, and with ES it was about the old pop stars plus a fair bit of requests. P O'G's chat was just random nonsense combined with requests. How does this represent an improvement? The same thoughts about Ed Stewart went through my mind as well Minx. I really enjoyed his show but Johnnie was always a favourite of mine so it was good to have him in that slot. This change makes no sense to me at all. Didn't hear any of this yesterday but shall try next week. Paul O'Grady is too 'end of the pier compere' for me. I expect he pals around with Cilla and Tarby. A very interesting show but none of the usual Paul O'Grady stuff. It's always a bit odd when comedians go all serious but I think many will like it- the show was ok. I think OK just about sums it up. All in all not a show I shall go out of my way to listen to. I agree that Ed Stewart and Johnnie Walker's shows were superior to Paul O'Grady's. I guess his style of presenting just isn't to my taste. When I heard his promos for the show i thought "This will be awful!" but i had the radio on, it came on and was great! Wonderful eclectic selection of music. a real treat. BTW, is that a Brummie accent? Like his jingle. Wise Buddah also sung it for him. Could it be that Wise Buddah has a contract with R2 to provide the on-air package for the current relaunch at the moment? That would explain why Wise Buddah "sung it for him" in lots of cases. Personally thought the jingles for the show were awful! I think it would be better if they just inserted his name into the stock R2 jingles. I don't think Wise Buddah jingles are very good, either. They're not even that reminiscent of the period in focus. I think in many cases they do with the Zoe Ball ones? As it's a Wise Buddah production they fund the show with stuff like the jingle package. No. The jingle packages are commissioned separately. When I first heard the Paul was joining Radio 2, I wasn't really that keen on the idea, and I didn't listen to his show on Sunday either. I thought it would be another of those "another TV celebrity on Radio 2" type programme. I find his TV show too lively which is another reason why I didn't listen. However after reading that some of you have enjoyed it, I think I might take a listen. I heard the trail for the show and the jingle on the Wise Buddah website, and agree that they are awful. Did anyone hear the new Groove jingle he played when he sat in for EP a few weeks ago? I don't see why he needs Wise Buddah jingles when he could use the existing Groove one. (I posted it on a topic on JingleMad this morning if you want to have a look at that and hear the jingle). Lilly Savage? I couldn't stand her on the telly. Blimey, Mark. Is "jinglemad" your favourite website at the moment? You're sure as hell plugging it like it's going out of fashion! Looks to me that PO'G is merely supplying the voice and the others in the control room are flying the ops. I guess that's the point you're making by posting the pic, Mark? 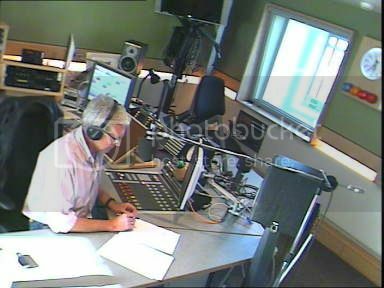 He is on the same side of the desk as Ken Bruce, Sarah Kennedy & Bob Harris, who also use that studio. Compare that to when Zoe Ball was doing Ken's show this last fortnight from Lynn Bowles' side of the dsek. What's interesting is that they've rigged a mic on a floor mic stand as opposed to using the mics that are incorporated into the desk setup. I assume that POG's mic's XLR is direct-wired into the studio wall-box and tielined from there to the control room mixer via the patchbay. It's amazing to see the webcam on a Sunday. I've just tried to see the clock on webcam feed right now. Does it say 10.30? Yes it is. A few years ago, when Desmond Carrington was on Sundays, there used to be a webcam in his studio as well as the 'Scotcam' outdoor view and also when his current Tuesday evening show began. These days it seems to be off. I think that was about it for webcams on Sunday. It does look like Ken Bruce's studio, and if it is I've been in it, and the control room is to Paul's right. In fact you could almost be looking through the window that separates the two. I switched on just before half 6, forgetting that Alan starts at 7, but I enjoyed the Motown 3. I think Paul's position is to give him a direct sight-line into the control room (to see visual cues, etc) whereas others who don't self-drive (Zoe Ball, for instance) don't worry so much and so sit the other side of the main desk. I think Gary Bones was probably sat opposite side to Zoe, I heard her mention him the other day as being there. There is another guy who is at probably the main controls as well. t's the same set up in the other one that TW,TV and CE use which is next to Ken's. Yes, that would explain O'Grady's position, too. In the case of Zoe etc the person driving the desk is more involved in the programme (and directly opposite the presenter) whereas PO'G's production team is behind the glass in the control room, hence the lashed-up mic which gives Paul a direct sight-line. So Helen, when Terry and Ken are doing the handover in a morning, can they see each other? No they can't see each other. If you imagine 4 rooms in a row, the presenters are in rooms 1 and 3. The producers are in 2 and 4 and there is an inner door and a large window between the presenters and producers, but not between 2 and 3. Hope that makes some kind of sense! I went to the show with BDG in March 2005, when they were still in the old studios then when Jezzaexiles was going, we went again in April 2007. The first time Jeremy had us in on one of the discussions and really surprised us by involving us live on air. As for the '88-91' well, he took me by surprise again and with about 30 seconds notice! Fortunately I've a recording as it's my 30 second claim to fame! The second time we just sat in but were in Ken's studio for about half an hour with Gary Bones and met Lynn, Deadly, Alan Boyd and of course Ken himself. We also met Norm and Hellen Back (TOGS) who were there taking photos for the 2008 TOGS calendar that day. 2 brilliant days I won't forget! Sounds like some geat experiences Helen. I'm sure the one thing you noticed about the new studios, compared to the old studios, is just how radically different the technology is. In the back of old production studio there were 2 emormous reel to reel recorders. I asked he producer if they were ever used and she said very rarely! For some reason I thought the atmosphere was better in the old ones not exactly sure why now, maybe just a sense of history and who had sat in the same seat that I had! They'd be Studers. Lovely machines and workhorses of the BBC for decades. A friend of mine (who builds studio systems) bought one at an auction of old studio equipment recently, and picked one up for £20! It's ex-BBC and he uses it to transfer old master tapes to digital files for a radio programme archiving company. The sound from properly set-up analogue tapes is in many ways better than digital.